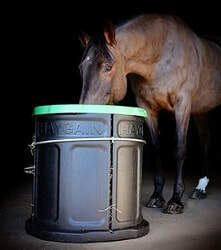 The slow hay feeder manufactured in the UK by Haygain is an innovative feeder for horses that enables them to graze in comfort and slow down their eating pace, protecting their digestive system from health problems. Providing horses with a slow hay feeder allows them to eat constant but regulated amounts of hay on a regular basis, reducing the risk of colic, gastric ulcers, laminitis and obesity. The slow hay feeder can be filled with hay that has previously been treated in a hay steamer, making it more palatable and reducing contamination risks. Using a slow feeder encourages the horses to adopt a natural position when eating in a controlled environment and reduces the mouthful amounts, creating a protective layer in the horse's stomach and preventing health issues. With the slow feeder there is no cross-contamination between the horse feed and its bedding. ​Please note this product is currently out of stock. The slow hay feeder makes horses work a bit harder when getting their hay. It encourages the horse to adopt a natural feeding position. The slow hay feeder will save time and money by having minimal wastage. The slow hay feeder improves hygiene by keeping bedding and forage separate. The slow feeder regulators have different sized, shaped holes, and varied combinations to allow the horse a controlled and natural grazing experience. By eating from a slow hay feeder, horses are less likely to suffer health problems such as ulcers or other gastric disorders. The slow hay feeder reduces anxiety and stress levels in horses. The click-and-secure system (easyon) allows an effortless filling of the slow hay feeder and changing of the regulators. The four air and light shafts on the sides of the slow hay feeder ventilates the feed throughout so the horse can eat in comfort till the very end. The shiny metal ring on the outside of the slow feeder goes down like a gauge as the horse eats, showing the eaten amount and the amount left. The slow feeder has been designed specifically for horses, to enable them to eat comfortably by mimicking their natural feeding habits. The entire base of the slow hay feeder can be filled with sand for maximum stability or alternatively tied to a wall from its built-in fixing points. 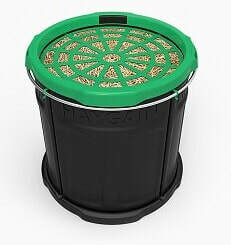 The slow hay feeder is easy to clean through the water drain points located on its base. To prevent the regulator from tipping, the slow hay feeder has a unique design with an outside sliding mechanism. A steel ring shows the level of forage remaining in the slow hay feeder. The slow hay feeder has a refillable base for increased stability. Manufactured in the UK from food safe materials. Ventilation apertures on the sides. Flexible and strong engineered plastic used for regulator grid. The large open slow hay feeder allows the horse plenty of room for head movement. The drain points allow to get rid of the excess of humidity from the hay. The slow hay feeder is designed for individually feeding one horse. It can hold up to 14 kg of hay or haylage. 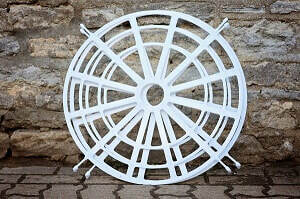 The slow feeder is manufactured of strong and horse friendly materials. 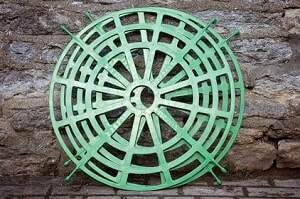 There are 2 interchangeable regulator grids icluded the slow hay feeder: Easy (white) and standard (green). 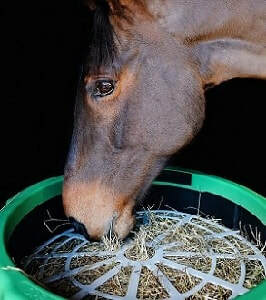 The slow hay feeder comes with two forage regulators, allowing a constant supply of horse feed through the openings and increasing the amounts of chewing the horse does, maintaining a flow of saliva which helps to regulate stomach acid and ensure the horses health. It is best not to use the slow hay feeder regulators for the first few days, while the horse gets accustomed to this new way of feeding and to lowering its head down inside. After the initial trial period, when the horse is confident, you can introduce the slow hay feeder standard regulator. A natural grazing behaviour is encouraged by the different shaped holes of this design. The slow hay feeder slows the horse's eating habits. A natural grazing behaviour is encouraged by the different shaped holes. The horse feeds from the slow hay feeder at a slower pace. It reduces the amount of hay that the horse eats per bite. Call us on 0845 3731 832 for sale prices and more information.